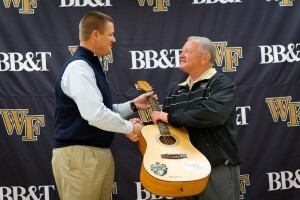 Scott Ramsey, president of the Franklin American Mortgage Music City Bowl, presents an acoustic guitar to head coach Jim Grobe. Paul Bond (’89) and Lauren Matise (’07) are looking forward to welcoming classmates and other Wake Foresters to Nashville when Wake Forest plays in the Franklin American Mortgage Music City Bowl on Dec. 30. 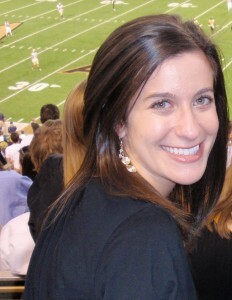 Bond, president of the Wake Forest Alumni Club in Nashville, is a commercial banker for SunTrust bank. Matise, president of the Young Alumni Club, is a graduate student in the PhD cancer biology program at Vanderbilt. For more on the Music City Bowl. 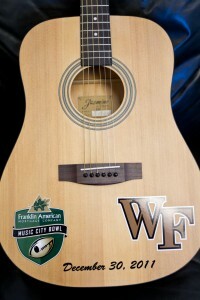 visit Wake Forest’s Game Central website or the Music City Bowl website. 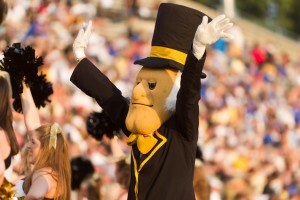 Are you excited that Wake Forest is playing in a bowl game in your city? Paul: I am very happy that the Deacs are coming to the Music City. I don’t get back to Wake very often so the chance to see them play in my own backyard is a treat. And hopefully I will get to catch up with lots of friends from the class of ’89. Lauren: I am very excited! Several alumni will be coming into town that graduated around the same time, and some close friends will also be coming. It is wonderful that everyone can converge in “my” city since all of my friends are spread across the country! Paul: Lower Broad and the honky tonks like Tootsies and The Stage; The Ryman; Country Music Hall of Fame. Great places to eat include Virago and Café Margot, and there are lots of good spots down in The Gulch near downtown. Lauren: Honky-tonks in “Nashvegas” are a must-see on Lower Broadway. If you are a country music lover, you will love The Bluebird Café. Ru San’s is the best sushi in town in The Gulch, and nearby is Urban Flats, Virago and Whiskey Kitchen. Paul: Nashville has a great New Year’s Eve celebration downtown. Check out this site for more details. Lauren: Going to any of the downtown venues – they will be packed, but it will give you a flavor of the city, and you can switch between nearby venues if you’d like. Midtown Nashville also has good options. What do you like about living in Nashville? 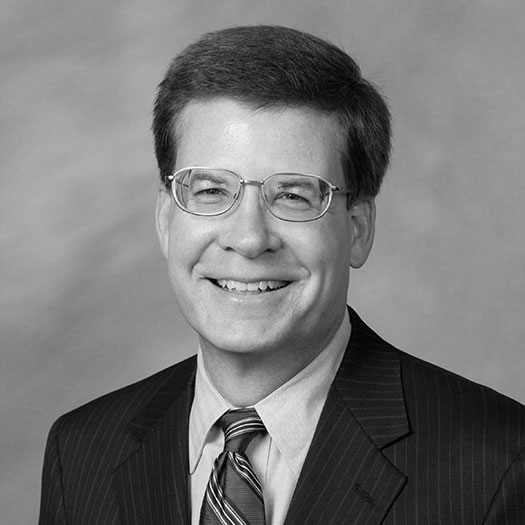 Paul: Nashville has a great mix of people, businesses, restaurants and activities. And there is always something happening to keep a family of five like mine busy. Lauren: I love having a big city feel (symphony, art galleries, professional sports) with an intimate community (festivals, friendliness). Having state parks and nature less than 15 minutes away brings nature and a city together like none other! The Nashville Club is pretty active; tell me about Wakestock and about any upcoming events? Lauren: Wakestock was graciously funded by the (Alumni Council’s) Innovation Fund, and we were happy that Wakestock enabled alumni to showcase their talents at our annual alumni picnic. We will typically have game watches for all televised games, and our young alumni started an ACC-wide Young Alumni Happy Hour. More activities are slated for this spring, including another ACC-wide Happy Hour. For more on the Nashville Club, visit the club’s website.